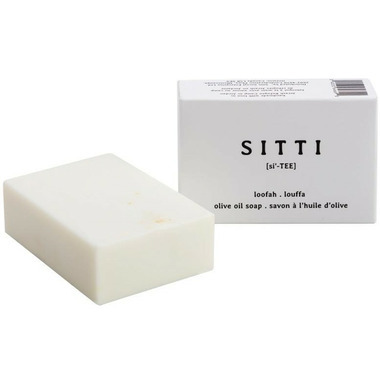 Sitti Soap bars are all-natural olive oil soap bars. Each bar is handmade using the traditional cold-press "Nabulsi" method, passed down from generation-to-generation of Palestinian women. Sitti sources their olive oil from local farms in Jerash, Jordan. Loofah is a coarse, fibrous material, used like a bath sponge for an all-natural exfoliating experience. Ideal for body and hand-washing. Keeps skin moisturized and nourished. An essential addition to your daily skin care regimen. Friendly to sensitive skin, including those who may suffer from acne or eczema. Ingredients. 100% pure Jordanian Olive Oil, Water (aqua), Sodium Hydroxide. Loofah Plant. No additives, preservatives, artificial fragrances, alcohol, animal by-products, or perfumes. 100% Vegan. Made by hand.